Since 1961 (when we first appeared in an episode of the TV series, The Avengers), The Grim’s Dyke has often been used as a TV and Film location. It’s not surprising with our beautiful Victorian appearance, typically English interior, and stunning location and grounds (oh, and did you know we apparently have a resident ghost?). In 1968 it was used as a film location for what was to be one of horror heavyweight, Boris Karloff’s, final performances. The film was entitled Curse of the Crimson Altar, a British horror film directed by Vernon Sewell and staring alongside Karloff (Left. Photo Credit Doctormacro.com), another great British horror actor – Christopher Lee. The lead role however, went to Mark Eden; another British actor, who later became a household name for playing Alan Bradley in Coronation Street. The film centres on a remote house, Craxted Lodge (Grim’s Dyke) owned by Christopher Lee’s character, Morley. Robert Manning (Eden) is looking for his brother, known to have visited the Lodge prior to his disappearance. Professor Marshe (Karloff) informs Manning that Craxted Lodge is actually home to an ancient witchcraft cult and he burns it – and its owner – to the ground. Of the three main male roles, Mark Eden is the only surviving actor. 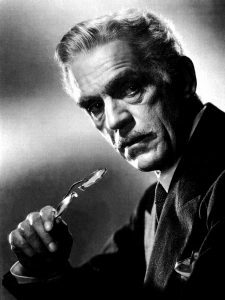 The Curse of the Crimson Altar was the last Karloff film to be released in his lifetime. He died in February, the following year (1969). Christopher Lee went on to appear in over 100 other films, prior to his death in June of this year (2015). Whilst the Crimson Altar is long gone, you can see many of the rooms and locations used for filming (including our gothic and ornate marble fireplaces). The hotel and its grounds are open to residents and visitors alike (you do not need to be staying at the hotel to visit). With ample parking, you can also make the most of the 40 Acres of gardens and woodland. We look forward selling your soul to the devil!